Over 1000 years have passed since the Battle of Yavin. The New Republic has a hold on the galaxy with only a few sectors defying their rule. Force wielders are commonplace, and the most significant ones are the Jedi. They are no longer tied to the government, as they cannot side with corruption. Yet they still operate to bring peace to the Galaxy, and balance to the force. However that balance is being threatened. After several centuries, whispers of something darker grows. Rumors of red-bladed Jedi spread. Something lurks in the shadows, something sinister that may threaten the galaxy once more. Dathomir, the blood planet, looms in the distance, and a small ship flies towards it. Dren squeezed his hand around his lightsaber hilt, trying his best to calm his racing heart. There is no emotion, there is peace, he reminded himself. There is no chaos, there is harmony. He cleared his mind. “We’re hitting Atmo!” The pilot called over the comms. The ship shook violently as it hit atmosphere. Dren looked up to the other five Jedi Knights he was travelling with, but they all seemed calm while sitting. Though, it was hard to tell, as he could only barely see their eyes under the dim red light of the ship’s cargo hold, and under the shadow of their hoods. Each of them had a mouth mask on, which was designed to help breath when underwater or in hostile environments, and designed to aesthetically cover the facial features with an intricate design. He knew them all, even if only through association. Jedi Master Lotheal was in charge of this mission. She was a Female Twi’Lek with green skin, and one of her Lekku had been cut off in battle. Dren knew very little of her, but only knew she was kurt, brutally honest, and sometimes difficult to get along with. So it came to a surprise to Dren when she had approached him about joining the Jedi Shadows, loosely designed after the same organization during the Old Republic. She told him it was because he had mastered a few stealth abilities and techniques, and was skilled in combat. However he still hadn’t mastered force cloak, which was the ability to bend light, and for the more skilled--sound, around you. It was a common ability that the Shadows used. Despite knowing this, they still wanted him to join. They were tasked with finding and destroying Sith artifacts, like holocrons, talismans and even temples, as well as any Sith that may get in the way. However the Sith hadn’t been seen for over 600 years, so it was unlikely they would run into any. Still, Dren had to be careful. 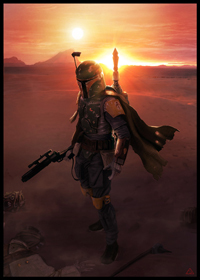 Not only was this his first mission with the task force, where previously he had only done humanitarian missions as a Jedi Knight, there were also rumors from Jedi agents that there were Sith spotted in the Galaxy, even near Dathomir. No Jedi agent had seen any Sith, but locals claim they’ve seen the red blades. The ship stopped it’s chaotic shakes, and came in for a more controlled glide. Dren could see the red sun lighting up the interior of the ship. “Coming in for a landing!” The pilot said over the comm. It took only moments as Dren’s inside lurched from the rapid descent. He put on his face mask, and clipped his lightsaber to hit belt, making sure to drape his robe over it. He put up his hood, and held on. The back of the ship dropped down as the ship’s engines powered down. All six of the Jedi walked out, and they were exposed to the sudden fog creeping in. The way it moved--it was as if it were alive, but Dren knew that couldn’t be. Dathomir was a strange place. All red from the sun, with trees bare of leaves, looming over like claws ready to grip its prey. Dren knew that Rancor’s came from Dathomir, but hopefully they wouldn’t run into any. But Dren felt something creeping over him, like a cold trickle down his back. Last edited by Corrin on Tue Mar 14, 2017 1:56 pm, edited 1 time in total. The white blade of Aeris Leneer came close enough to the neck of her sparring partner that you could smell the singed hairs at the end of his blonde beard. She did not, however, strike to kill, so the moment the other Lords around them declared her the winner, she deactivated her blades, clipping them to her belt before bowing in respect to her opponent for a hard-fought match. Of course, from the moment they stepped into the arena-like area of the abandoned temple she'd known that he was no match for her. He rivaled her in duelling and he was undoubtedly stronger than her physically, but her strength in the Force was far greater, and in the end, that always made the difference. "You are well on your way to becoming a Darth, Lord Aeris." she heard the deep voice of Darth Malicios speak up and she turned to face him giving him a bow. "Thank you, Darth Malicios." She replied in her usual calm tone. "Yet another reason why I have chosen you for this next mission." He spoke again and she waited, her astute green eyes focused on him as he spoke, "There are rumors of an ancient Sith temple on Dathomir, which may potentially hold archives from the old Sith Empire." He explained, studying her expression for any signs of a response from her, but found none. "You will lead a small team to secure the temple. Once you have secured the temple and confirm the presence of an archive worth defending, you will contact us and we will send in another team to aid you. While you wait for the second team to arrive, you may learn what you can in the temple so that you may report back to me when the time comes." He continued, instructing her on the mission. "Yes, my Lord." She replied with a small bow of her head rather than a full bow. "You may choose your team as you see fit and leave before nightfall. The coordinates are on this datapad." He instructed her, waiting for her to take the datapad from a young woman who offered it to her before he stood. "Do not fail." He added before leaving the area. "I never do." Aeris replied before turning on her heels and pointing to Saila Kilvaari, a blue Twi'lek, Cain Asto, the man she'd just beaten in combat, and two others. "You're with me." She informed them and kept walking. "Find Lord Jax for me, too, Cain." She instructed the light-haired male before she strolled out of the room, "Meet me in the hanger in two hours." She called back to them as she disappeared around a corner and made her way to her chambers. She gathered her things, took a quick shower, had a small bite to eat, and then sat in the center of her room, meditating. It was a habit she'd picked up during her time as a Jedi Padawan, and one she'd not managed to shake, even after all these years. She knew that she was meant to keep all of her negative energy and focus it into making her stronger, but when she was alone and no one was watching, she always found herself doing this. Some part of her hated it, or hated that she was still hanging on to part of her old life, but regardless, just like certain memories, she hadn't managed to let it go. Her mind wandered briefly to him and she wondered what he would think of her now. What would he think of the woman she'd become? The thoughts lingered briefly before she brushed them from her mind. It didn't matter. That was a long time ago. She'd never see him again so there was no sense in wondering. When it neared the time for her to meet with her team she stood, clearing her mind of all thoughts and gathered her things before heading for the hanger. She was the first one there, which was fine by her. So long as they weren't late, she didn't care if they showed up now or ten minutes from now. She boarded the small ship they would be taking and put her things in the small room that would serve as her quarters while she was on the ship, and then she headed to the cockpit where at least the pilot was there, readying the ship. Once the others arrived they headed for Dathomir. After arriving on the planet they spent the first day making their way through the mountains and deep into the forest that hid the ancient temple. It wasn't easy to find a temple that no one could confirm truly existed. Aeris, however, was far more perceptive than most, which made the task much quicker than it otherwise might have been. It didn't hurt that the dark side still hung over the temple even now. The large temple was covered in vines and partially obscured from view by the overgrown foliage surrounding it. Statues lie broken on the ground around the temple and in some places the walls had broken, sending chunks of stone crashing into the ground. It was clear that the temple was at least several thousand years old and based on the areas surrounding it, the condition it was in, and the overgrown foliage, it had been centuries, if not a millennium since it had seen its last visitors. Still, it was easy to see the fine craftsmanship and the beauty the temple once held. It was a truly amazing sight. For Aeris, however, it was more than that. It was like living history. She could see and feel impressions left behind in the Force by those that had once occupied the temple. For now, however, she kept these things at bay and focused on the task at hand--clearing the temple. Once it was cleared, she would have plenty of time for learning what she could, both from the archives and through the Force. She worked with her team to clear the path to the entrance of the temple, cutting away the overgrown plants and getting rid of any creatures that dared attack them. Once they reached the entrance, Cain tried using the panel to open the large door while Aeris deactivated her lightsaber and clipped it to her belt. "The panel is dead." Cain reported, something that Aeris had expected. "Stand back." She instructed, giving them a moment before she reached out with the Force, took hold of the door, and forced it open, pulling the two sides apart. "Cain, take the north side, Saila the east, Jax the west. Rixar and Titus, you two secure the perimeter around the temple. I'll take the top floor." She instructed them as she strolled into the temple and headed for some nearby stairs. Each of them gave a nod of understanding before taking off in their respective directions. Aeris climbed the stairs until she reached the end of the portion that remained whole, and then she drew on the Force and leaped to the top of the stairs, igniting her lightsaber as she did. Despite the broken staircase, there were many creatures living on the upper level. She gathered that there was likely at least one alternate route to get up, but she'd worry about that later. The moment she landed she took to clearing out the creatures that had overrun this level of the temple. She made her way into the first room that held archives and cleared the few creatures who had made their homes there. There were many shelves housing data, many of which were covered in vines that had grown up through the windows or through cracks in the walls. Some of the data was undoubtedly corrupted, but perhaps some of it could be recovered. She sliced through the vines with her white blade before clipping it to her belt and clearing the vines from the first shelf. She examined the data on a portion of the shelf, deciding that some of it was at least potentially viable. From there she left the room, proceeding to repeat the process in each of the remaining rooms on the level before dropping down to the ground floor where her team waited. "The temple is cleared, and we found several archives." Cain reported. "Great. Jax, you'll be going through the archives on this level." She instructed the dark-haired man. His cybernetics and intellect would make him more useful in this task than any of the others. "Rixar, Titus, you'll take the first watch. Cain and Saila, take a few hours and get some rest, then switch out with Rixar and Titus." She instructed them. "I'll be in the archives on the upper level. Once I confirm that the archives are worth defending, I'll call in my report." she added before heading toward the stairs. "Call me if you find anything weird or if you otherwise need me." And with that she leaped up to the next level and went to work in the archives. Aeris managed to get one of the terminals working and went through some of the data, ensuring that there was not only viable data, but data worth their efforts. Once she had gone through some of the data she called to report what they'd found. After giving her report she went to work going through the archives, learning what she could in the short time that she had. She wasn't sure whether or not she would be left in charge of going through the archives or if it would be given to someone else once the reinforcements arrived, so she focused on going through as much as was possible in the meantime. There were many things to learn in the archives, from the teachings of various Sith Lords to historical knowledge about the Empire of old. One Sith Lord that Aeris found particularly interesting was one called Darth Imperius, a member of the Dark Council during the days of the old Sith Empire. She was considered to be compassionate and heroic, often tending towards showing mercy and kindness, as opposed to the mindless violence and brutality often shown by other Sith. She utilized the dark side of the Force without becoming truly evil. She seemed to be a perfect example of a grey force user. She drew power from the dark side, yet followed many principles of the light. She even spent much of her life trying to reform the Empire from within. Aeris found this quite fascinating despite herself and spent much of her time searching for information about this mysterious figure from long ago. Of course, she went through every archive she came across, committing the information to memory, but she took more care in going through the information she found interesting. She didn't pay attention to the time that flew by while she went through the archives. She didn't even realized when day faded to night and night once again turned to day until Jax Eros came in and broke her concentration. "Are you going to eat? Or sleep, maybe?" He asked, quirking a brow. "Hmm?" She looked up at him before checking the time. "Oh. I didn't even realize how much time had passed." She stretched her arms above her head, put aside the datapad she'd been looking over and stood. "You really get into this stuff, huh?" He questioned, a brow still raised. Aeris shrugged, playing it off. "Knowledge is power." she replied simply. "Yeah, I guess." He replied with a shrug, seeming to buy her explanation. "Well, you should probably get some sleep." He offered. "I don't really sleep." She replied, her voice once again calm and simple. "Well, then rest. Or at least eat something." He retorted, insisting that she get out of the archives for a bit. Aeris heaved a sigh before giving a resigned nod. "Fine." she begrudgingly agreed. "How are the others" she asked, looking back at him. "They're fine. Saila and Cain took a break for a few hours and got some sleep while the other two kept watch, and they switched out. You're the only one who hasn't rested." He explained, eyeing her. Aeris waved off the concern, or whatever it was. He knew by now that she rarely got any real sleep. "Great. I'm going to find something to eat and I'll be back." She informed him, to which he nodded, following her out of the archives and then going left at the corridor, where she went right. He was heading back to the other set of archives, she was heading for the section of the temple she'd decided to store her things in. "Hey, Jax." She stopped and hollered back to him, waiting for him to stop and look her way. "Hmm?" He quirked a brow as he looked back at her curiously. "Be careful while I'm gone." she warned him. "I always am." He replied, although he wasn't sure if she was referring to the other Sith who kept watch outside, or an outside threat. "I feel another presence on this planet. Strong with the Force." She explained. She caught the look in his eye, as if he were wondering if it was the Force users who inhabited the planet. "It wasn't here when we arrived. It's too far away, obscured. I can't make out any specifics. All I know is that it's new, and it's not the reinforcements we're expecting." That was all the explanation she offered before she continued on her way. "Got it." He responded before he, too, continued on his way. Jax was one of the few Sith Aeris could actually stand. Perhaps it was because they had similar starts. Many of the other Sith had started as grey Force users who seemed to fall to the dark side more easily and more completely. He, like her, had once been a Jedi padawan. He'd been in the same academy she had, but they'd not been friends during their time there, probably because he was a few years older than she was. They'd not really met until they left the Jedi. Unlike many of the other Sith, he wasn't excessively cruel or hard to get along with, which made him more tolerable. She brushed the thoughts from her mind as she entered a large chamber, which appeared to have once been a meeting place of sorts. She found something to eat in her bag and then took a seat in the center of the room. She wouldn't sleep. She rarely did. Any sleep she got was riddled with nightmares and memories she wished to forget. Instead, she chose meditation as a way to clear her mind and allow her body to relax and recuperate, drawing on the Force to aid in this process. Of course, to do this, she drew on the light side of the Force, just as she often did when using her Empathy, but no one knew this, just as they didn't know about her meditation. After taking a seat she used the Force to ensure that the doors to the chamber were sealed shut and then she cleared her mind of all thoughts. Nothing remained but the Force, which she felt flowing through her. In doing this she saw everything more clearly. Her mind was clear and her senses heightened. She knew now that there was definitely another presence here. Multiple, she thought, but even in this state she couldn't quite distinguish them. They were masked, blocked from the Force, at least as much as was possible, and thus blocked from her perception. It was impossible to tell if the presence was a threat, so she allowed it to slip from her mind rather than trying needlessly to learn more when it was simply out of her reach. The presence she felt was still far away, from what she could tell, so it wasn't an immediate threat, which meant that she at least had time to rest for a few hours, then she could search once more. The others would keep watch and alert her if she was needed. So, she put the thoughts from her mind, putting herself into a deeper meditation that would allow her to rest and recuperate. Dren Orkan followed the group, lingering just a pace behind. He was weary of the surroundings, always looking back, lest something come for them. Be it a beast, or a person. He wasn’t sure which he was worried about more. He took note of the valley, always fluctuating between too much space to cover properly, or so little they had to walk in single file. They adjusted their formation for each situation, with hardly a spoken word. The Shadows were often recluse, and didn’t care for pointless chatting. Dren realized he fit in more and more with them. The walls glistened with a moisture that sat in the air. The fog was of strange color of pink, but Dren couldn’t tell if it was because of the red sun, or because of what the mist was made of. He had time to let his mind wander. Perhaps the mist had a mind of it’s own. It seemed to move in unpredictable ways, despite the wind being absent. Despite being detached from the force, he could still feel the Dark Side in this place. He could feel it, like a drip of frigid water rolling down his back. He touched his neck, but it was dry. He turned his head to look behind, but there was nothing. Only the mist, and it seemed to form a figure--or perhaps it was just his mind. The mist dissipated softly. He turned back, and saw his Jedi comrades were gone. He quickened his steps to make it into the narrowing valley, but he didn’t see them. “Master Lotheal?” He called out, not too loudly. The chill ran down his back again. He turned back, and saw the mist forming a mass with tendrils. Parts of it were transparent, while others, as thick as if it were organic. It launched itself towards Dren with a screech. Dren took out his lightsaber, and lit one end, holding the green blade in front of him as if a shield. The mist picked up speed. Realizing a lightsaber would have little effect on mist, he threw his hand out, and pushed it with the force. The mist exploded, and shot out in every direction, except at Dren. It disappeared. Dren turned off his lightsaber. “Didn’t you see that?” Dren asked. “See what?” Jedi Master Lotheal asked. “Agreed,” said Master Lotheal. The rest nodded. At the very least, Dren was glad they weren’t thinking him crazy. Still, he wasn’t sure what he saw, and why he was the only one. It didn’t sit well with him. He attached his lightsaber back to his belt, and draped the robe over it. He had a feeling this planet held secrets that went deep to millions of years ago. The force was strong in a place like this, more so than other planets--Dren could feel it. Realizing he had broken his force concealment, he closed his eyes and focused, hiding his signature again. They continued on their way as the day went on. There was always a chill in the air, mixed with the occasional warm wisp of humid moisture. It had been several hours when they finally came upon the statue. It was curious, because it seemed to have fallen. It was upside down and at an angle. The legs were cracked, and it was covered in moss and vines. If one didn’t know what to look for, one might think it was just a rock. Jedi Knight Renth removed the moss from the head, careful to reveal the features. It was a cloaked figure, his face wrinkled with age. “I don’t recognize who this is, but he wears what may be a sith cloak,” Renth told them. “We need to find where this came from. I have a feeling we won’t find answers down in the valley.” The Jedi looked up at the cliff. They all knew the answer. “Then we shall climb,” Jedi Master Lotheal told them. As Aeris sat in the room meditating, her mind reached out in every direction. Her senses were open, reaching out, feeling everything through the Force, which coated the planet, finding its way into every living thing. She took it all in, as though the Force itself were simply another extension of her senses, allowing her to see and feel things that otherwise would have been impossible. The dark side was strong in this place, which became all the more evident as she reached into the Force, using it to extend her senses to allow her to search the planet for nothing in particular. It was as though the Force was a thick, dark fog that blanketed the planet, seeping into every crack and crevice, tainting everything it touched, from the plants to the wildlife, and most importantly, the people. Everything was heavy and dripping with the dark side. This made it feel even stranger for her to draw on the light side to heal her, to rejuvenate her, while her senses stretched out through the dark side of the Force that surrounded her and everything else. Nevertheless, she managed. It was a little more difficult to draw on the light in a place so heavy with darkness, but it was not impossible, and the heavy presence of the dark side made it easier to mask the light side, lest any of her companions catch her and decide to betray her. Not that she thought than any one of them alone was of any particular threat to her, but if they could work together, they would be. While her body recuperated and her mind relaxed, her senses stretched on and on, reaching out across the planet. It was then that she felt something. An anomaly in the Force. A presence that wasn't there moments before and which was quickly cloaked once again. A familiar presence. Her eyes popped open when the presence suddenly disappeared again and she was once again fully conscious. Her green eyes were slightly wide as she considered the possibility that it was, in fact, him. That wasn't possible. And yet, she couldn't deny the familiarity of the presence any more than she could deny the emotions that began to build inside in that moment. Pain, anger, sadness, and something else that she couldn't quite put her finger on. Why, after all this time, did he still mean that much to her? Why could just the thought of him still evoke such powerful emotions? Regardless of whether or not it was him, the fact remained that the presence was undoubtedly at least a light side Force user and likely a Jedi. That explained the distant, unidentifiable presence she'd felt before. She may have only felt one presence, but she had no doubt that the singular presence she'd just felt was not alone. She couldn't say how many, nor could she gauge their power, but she had no doubt that they were there and they were likely heading this way. She hadn't been able to pinpoint the vague presence hours before, but she had a good idea of where this one had been, and it was closer than the other, of that she was certain. There was no way she could truly relax now, nor could she simply sit here wondering or letting her mind drift to things she shouldn't feel, things she should have let go long ago. This was a potential threat that she couldn't ignore. The others needed to know and she needed to get as much done in the archives as was possible. It was unlikely that their reinforcements would arrive before these new guests, and she had no way of knowing how powerful they were, so it was best to prepare for the worst. She stood gracefully and spun on her heels, heading for the doors of the chambers with a swish of blood red hair and dark fabric. The doors swung open without her so much as waving her hand in their direction and she walked through them, turning down the hallway that led to the main staircase connecting this floor with the ground floor. "Meet me at the entrance. Now." She spoke over the comms that they all carried. She walked toward the stairs, but rather than take them, she dropped straight down to the ground, using the Force to cushion her landing. The other five Sith all stood around her. Jax and Rixar looked at her curiously, Titus and Cain looked confused and possibly slightly annoyed, and Saila masked whatever she was feeling, although her physical mask did little to hide her emotions from Aeris. Of course, Aeris cared little what they were thinking and feeling. They did as they were told and that was what mattered. "It seems that we have some company." she informed them, her voice simple but her expression more serious than usual. "They are masking their Force signatures. I don't know how many there are, nor do I know their strength, but I do know that they are light side users and they are likely heading this way." She explained, pausing for a moment. "They will likely be here before our reinforcement." Her explanation was simple, not bothering with unnecessary details. "We need to be ready, so do what you can to ensure that we can defend the temple if necessary and keep your eyes and your senses open." She instructed those who would be keeping guard. "Jax." She looked his way and he nodded, knowing what she wanted him to do. They needed to ensure that they had as much information as possible before these "visitors" arrived. "Alright. Let's get to work." She instructed and the four who kept watch went off to ready the temple for whatever may come. Jax lingered a moment, studying her expression. "You seem... troubled. More so than usual." He observed. Aeris tossed a glance his way and shrugged, brushing off his concern. "I'm fine." She assured him with a calm and level voice, her expression completely neutral as she spoke. "We have work to do." And with that she leaped up to the next level and headed back to the archives while Jax shrugged and headed for the other archives. "If you say so." Dren tried his best to not look down. Still, he couldn’t help it. He looked, and a sudden rush of vertigo spun in his head. He closed his eyes, and grabbed on tightly to the small crevices and footholds he was positioned upon. The rock was slick with the impossible moisture always lingering in the air, and he was always worried he would slip. There is no emotion, there is peace. he reminded himself. Looking upwards, he saw his comrades climbing the rock face, as if they had no worry in the world, far from what he felt. They were agile too, widening the gap more and more. He continued to climb, carefully watching every step, when they finally reached the top. Jedi Knight Renth held out his fur-covered hand, and Dren grabbed it, pulling himself up. On top of the cliff was a forest full of thick trees and bushes. It was very unlike the clawed-trees that greeted them earlier. This planet was very strange indeed. Despite the concealment, they could feel the force surrounding them. It was strong in this place, perhaps explaining why it was so lush with life. The force works mysteriously like that. They walked only a few feet when they noticed a deep track in the ground, as if something heavy was dragged. They all looked at the drag marks, and studied it closely, and how they’ve changed over the years. The marks were in solid rock, explaining why they last all of these years. How old they are was up to speculation, which some of the Jedi tried to discuss. Meanwhile, Dren took a look around. He noticed some more rocks and formations. One of them was long and narrow, and looked a bit more man made. He walked over to it and touched the moss. It was deep and thick. He tore at it--a small piece--revealing a smooth surface. He removed more of it, and saw a face with horns protruding out of it’s skin. He didn’t recognize the species--but something about the face looked familiar. Not as though he had seen the face in a textbook, but more like he knew the person. It was a strange feeling, deep in his gut. Regardless, it was clear what it was. “Or perhaps they were pushed,” Dren added. The Jedi surrounded the statue. It looked to be cut at the base with a lightsaber, with damage marks on the surface. She was right. The statue had made a permanent dent in the ground, stretching well into the thick forest. So they all lined up and began to follow it. Dren naturally followed behind. He still felt a bit out of place with the group. In fact, he felt out of place in general, never feeling fully part of the Jedi. It was as though something was missing--or perhaps someone. He hadn’t thought of her for a long time, but made sure to push her out of his memory again, lest it cause more pain. He would focus on the mission. They took out their lightsabers and carefully cut the brush in front of them. They tried their best to not cause any damage, as all life is precious, but when they faced an impassable spot, they had no choice. Dren could hear the wildlife in the thick brush. He wondered where the Rancors lived, but figured a dense forest like this would be difficult for them to pass through. He assumed, and hoped, they were more at home to large fields and rock valleys. Still, something was in there, making sounds, screeches, and growls. It all seemed to blend into the music of the forest. It was droning with life. Dren made sure to keep cautious, always a weary eye. Jedi Knight Asha Porten, a female human Jedi with long white hair and blue eyes, stopped the group. She was kind and caring, with a youthful beauty both on the outside and the inside that surpassed any of the other Jedi. She was a bit out of place as a Jedi Shadow, but it was her skills with the force that gave her a place amongst the group. She had a way with the force, able to see things others could not. “Look,” she said with her soft voice, pointing into the bushes. They all took a moment to look. It was hardly obvious. Amongst the thick brush was even more brush, but formed into a large camouflaged hill. It seemed as though there were four more statues, but they remained intact and standing upright, and completely covered in foliage. They removed some of the foliage, and confirmed that they wore the same Sith cloaks as the ones they found before. They removed the foliage from the entrance, and what became clear was the it had been sealed, perhaps on purpose, with large rocks and boulders. It would be a simple task for a group of Jedis, except that they wanted to remain concealed. To use the force would compromise their concealment. So without so much as a word, one by one they began grabbing boulders, and pulling the entrance free. It would be tiring work, but it was the only way. The time passed both slowly and quickly all at once. Aeris thought it passed too quickly because there were so many things to learn, so much to uncover. Yet for the others, those who guarded the temple, time seemed to drag on forever, each moment a small eternity. They were all on guard, as Aeris had instructed them to be, but so far nothing had happened. It was almost eerily quiet. There were no signs of sentient life anywhere nearby, save the occasional wildlife that wandered too close. It was hard to believe that there were other force users--Jedi--anywhere near them. And yet they stood guard nonetheless, because Aeris had never led them wrong. Her powers of perception were unmatched. If she said someone was coming, then they believed her. Nothing else mattered. With her permission, however, Saila had gone to explore the temple further, rather than standing guard outside with the others. There were tunnels below that, presumably, led to the outside world. Secondary entrances, perhaps. Saila may be one of the hardest of them all to read, and she might seem as though she were calm, but underneath, she was the most restless of them all. Standing around, watching, waiting. It wasn't her style. If Aeris didn't give her something else to do every now and then, she would grow increasingly restless and irritable, and it would only get worse from there. It was best to put her to good use and find some more information about the tunnels and where they led. While Rixar, Titus, and Cain kept watch outside, Aeris and Jax continued searching through the archives, and Saila wandered the dark tunnels below. There was no light in the tunnels and the young twi’lek carried only a single handheld light, which was currently switched off. She didn't need it, not really. Light or dark, it made little difference to her. Saila, like Aeris, was quite perceptive. Her perception, however, was a bit different. Her strength lied in Force Sight, allowing her to “see” her environment without using her eyes. This was particularly handy in situations such as this, where there was no light, and any artificial light that was introduced was unlikely to be terribly revealing in the almost suffocating darkness. The first two exits she’d found had been blocked, seemingly intentionally, by boulders and large rocks. She hadn’t bothered to try to move them to see what was on the other side. If there really were Jedi around, the last thing she wanted to do was give away their location. She used her Force Sight to see what she could and then moved on. Besides finding these exits, however, she had found little of interest. Meanwhile, Aeris took a short break from her studying to reach out into the Force and search for any signs of the Force user she’d felt before. Once again, however, she felt nothing. She clicked her tongue and sighed, slightly frustrated by the fact that she couldn’t feel them. There was no time to dwell on this, though. She needed to keep working, so she forced herself to keep going, even as thoughts of him kept creeping up, trying to distract her. It made focusing incredibly difficult. Yet she kept on working, using techniques she’d learned as a Jedi to clear her mind of distractions. Several hours passed before Aeris was once again visited by Jax, who insisted that she take another break. She didn’t want to stop. There was still so much to do. Yet, she couldn’t deny that she needed to distance herself, if only for a short time. Despite her best efforts, she was distracted, making it much more difficult to focus on the task at hand. The longer she sat here, the more difficult it became to focus on her work. A break would do her some good, even if all that meant was getting away from the archives for a little while. Just as Aeris was about to head out of the archives, voice came across the comm. “Aeris… You might want to check this out.” The voice of a woman came over the comm. Aeris quirked a brow and glanced at Jax, who shrugged. “What is it? Did you find something?” she asked. “You could say that, yeah.” Saila replied somewhat vaguely. “I’m in the East tunnel.” She added. “I’m on my way.” Aeris replied, walking briskly from the room and jumping down to the ground below. “Let me know if anything happens here.” She called back to Jax as she headed down towards the tunnels. Like Saila, she didn’t need the light. She reached out and found Saila’s Force signature, closed her eyes, and let the Force guide her to her destination. Her Force sight, while not as strong as Saila’s, was strong enough. She focused on feeling through the Force more than seeing, but the concepts were not too terribly different, so she was more than competent enough in the use of Force sight to find her way around a dark tunnel. As she walked quickly and silently through the maze of tunnels, she reached out in the Force, searching for any other presence, any Force signatures other than those of her comrades, but she found nothing. Again. She mentally cursed but kept walking on in silence until she reached Saila, who was leaning against the walls of the tunnel, waiting. Aeris looked down the tunnel and then back to Saila. “That explains the noise.” She replied before closing her eyes and reaching out through the Force in the direction Saila told her. After several moments, she shook her head. “They’re masking their Force signatures. I can’t even feel most of their presences at all, let alone find any other information. I can feel two distinct presences, very faint, but this close I can make them out. The others I can’t make out. Not individually, anyways.” She sighed. “What do you want to do? Confront them? Go back to the temple?" Saila questioned. Aeris was quiet for a moment before she finally spoke up. "We'd be fools to confront them without knowing how many there are or how strong they are. Especially just the two of us. If they're strong enough to mask themselves from me, even this close, then they're strong enough to warrant caution." She replied, glancing toward the entrance and then back to Saila. "We fall back to the temple and prepare to defend it. They're uncovering the entrance by hand to avoid detection, which means that it'll be a little while before they break through, and then they have to find their way through this maze." she gestured towards the tunnels leading back to the temple. "That will give us time to prepare. We still won't know their strength, but they don't have the element of surprise, and it's better to gauge your enemy's strength while on the defensive than to run in head first and hope for the best." With that she began to head back to the temple. "Jax." she called over the comm. "Yep." he responded back. "We have company. They'll be coming through the tunnels. Prepare to defend them." she instructed. "Got it. We'll start preparations. You on your way back?" he questioned. "Yes. We'll be there shortly." she replied. "See you soon, then." And with that the comm fell silent and Aeris and Saila made their way back to the temple, using their Force sight to guide them, while the others prepared for the potential onslaught that was to come. Dren and Renth grabbed a particularly large boulder together, lifting from the knees. You train every day as a Jedi. You’re stronger from the force, faster even, but you still need physical abilities to match. Running, exercising, strength and speed training, it was part of the normal Jedi routine. However, despite that, this job was taking a toll on all of the Jedi. Many of them obviously would have preferred to use the force, but they needed to keep concealed, no matter who or what they might discover inside. Of course, they were also making a lot of noise, but not much could be done about that. They dropped the large boulder onto the pile they were creating just nearby. They were about halfway through, they assumed. Dren could still feel the dark side, but something new hit him. Something--familiar. Like a fleeting memory he didn’t know he had, or a sense of deja-vu. It was the force, but it wasn’t just that. He couldn’t pinpoint it. Just as quickly as that feeling came, it went. Strange, he thought to himself. This place held many secrets. He wondered if all the Jedi Shadows experienced similar things when they went on other missions. He tried to focus, and went for another boulder. This time he helped three of the other Jedi, who we’re trying to roll one particularly large boulder. He lifted with them and pulled it out of the way. With that last one, the few remaining pieces fell into a pile, which was easily removed. Dren nodded, but couldn’t help feeling a bit singled out. He was new to the group, he supposed, and didn’t want to think it was a judgement of his character. Still, that thought lingered. He was trying his best to fit into the group. However, no matter how well they might get along in the future--which is saying a lot as most Jedi Shadows kept to themselves--they also had abilities he hadn’t yet mastered. Force Cloak, for example, was one just out of Dren’s grasp. He tried almost daily to master it. He managed on a few occasions to mute his sounds, but not bend the light around him. He really wanted to master that ability, even desired it. Yet Jedi aren’t supposed to desire. He followed the group into the tunnel, carefully. He ignited his lightsaber, one blade only, as did the others. They all had double sided lightsabers, as was the way of the Jedi Shadows. Dren originally had a single sided, but searched for a second identical green crystal when he was accepted into the group. The second time he went to the crystal caves, it was far more daunting than the first time as a young padawan. He saw her there--a mirage. It was the force testing his mind and his endurance. He tried to not think about it, but it seemed like she was always there. Why was he thinking of her so much suddenly? He didn’t understand it. Perhaps the danger that they might face, whatever it was, had him on edge, and his thoughts naturally went to her--like they often do. They turned and ran as fast as they could. The tunnel began to collapse behind them like a cascade following them. A large piece of tunnel fell in front of them, just missing the group. Dren jumped over the boulder. A rock fell and hit him on the head. It hurt, but he was alright, and just kept running. They weaved, and jumped, and slid underneath, making sure to avoid every piece. They no longer concealed their signatures, and made sure to use the force to anticipate the falling rocks. They reached the end, a fork that broke off into two other tunnels, and dove away from the remaining debris. The cave-in stopped, and the Jedi stopped running. Some of them were coughing from the debris, and some trying to catch their breath. Whatever concentration they had on trying to conceal their force signature was gone, especially for Dren. He felt the force flow into him like a sudden rush of energy, giving him strength. “Is everyone alright?” Lotheal asked. They all nodded. The minutes ticked by as the Sith waited for any sign of the Jedi. Rixar joined Saila and stood watch over the entrance to the tunnel. He was a tall, medium built Miraluka who wore a dark cloth over his face where his eyes should have been. His strength in Force Sight was the strongest of all of them, so he was the ideal choice to join Saila in guarding the entrance. While they stood guard over the entrance, Titus and Cain watched the outside perimeter of the temple, just in case. It may be more likely that the Jedi would come through the tunnels, but it was still possible that they would find one of the other tunnel exits and make their way to the temple another way. Aeris and Jax had resumed their studies in the archives while the others kept watch. It had been nearly half an hour since Saila had found their visitors outside the tunnels. Aeris had returned to poring over the data in the archives nonstop since they’d returned. She was more exhausted than she cared to admit. It had been so long since she’d gotten a decent night sleep and at this point it had been a while since she’d stopped to rest or meditate either. She’d stopped to go into the tunnel to investigate, then she’d come straight back here. After a short time, without even realizing it, she drifted off to sleep. It was far from intentional or desirable, but it happened nonetheless. She didn’t sleep long, not even half an hour, but it was long enough for her to slip into a nightmare. It was the worst kind of nightmare, too. The kind that seems like a dream in the beginning, giving you everything you want only to take it away again. He was there, they were reunited, and for a short time she was happy, but then it turned dark. He, along with several other Jedi, began to attack her, surrounding her and trying to kill her. It was then, as her dream-self fought for her life, that she woke up suddenly. Her mind was still caught in the dream, so the moment she sat up, she threw her arms out to her sides, sending a massive Force wave in all directions. It was strong enough to shake the temple and even the ground below it, nearly knocking all the others off their feet. In the archive room, everything around her was thrown hard against the walls, including Jax, who had once again come to make her take a break, since she hadn't actually done so last time he'd asked. He used the Force to prevent himself, and everything else, from hitting the walls too hard, but the force with which he hit the wall was still enough to knock the breath out of him. Thankfully, though, it prevented the archives from shattering into bits when they hit the walls. They still took some damage, but not as much as they otherwise would have. “You fell asleep.” Jax observed. Aeris wore a frown as she did her best to calm the racing of her heart and clear her mind of the nightmare. “Yeah.” She replied simply as she stood from where she had been sitting on the floor. Jax crossed the room towards her, glancing around the room as he approached her. “I see why you don’t sleep.” He turned his attention back to her. “I don’t think the temple could handle more than a short nap.” He made an attempt at humor and Aeris cracked a small smile, “Yeah, no kidding.” She replied before glancing around the room and sighing. “Guess I’d better clean this up.” And with that she began using the Force to put everything back in its rightful place. Thankfully, none of the others had abandoned their posts to try to find out what happened. That was a small relief, anyways. Then again, with the way everything had shook, they might be a tad bit distracted. The force of the wave had probably been felt even in the tunnels below. If it was and it shook some rubble and such loose, it was likely to be somewhat distracting for those guarding it, and she doubted any of them would dare leave their posts one way or another. Jax was just about to suggest that she take some time to rest when her eyes suddenly went wide and she took a small step backward. “What is it?” He questioned. Aeris swallowed hard as she stepped back instinctively the moment she felt that familiar presence. This wasn’t like when she’d felt the presence before. This time it was unmistakable. He was here, and he was close. She ignored Jax’s question and reached out into the Force. This time the others weren’t masked. She could feel them clearly. There were five others with him. “The Jedi are in the tunnels. There are six of them. Prepare yourselves.” She called over the comm, looking at Jax. “Go. I’ll join you shortly.” She instructed. He looked for a moment like he would question her, but decided against it, nodding in acknowledgement and heading out to join the others near the tunnel. Aeris let her calm exterior fall the moment Jax left the room. She ran her fingers through her red hair and took a long, shuddering breath. Her mind was racing, fears creeping up inside, and old wounds opening, bringing with them the pain she’d thought she’d forgotten. Why? Why was he here? Why now? And why did it still matter? She felt too many emotion rushing through her, and to add to that, she also felt everything the others felt, from fear to confusion to anticipation, everything. The emotions weighed heavily on her, threatening to overwhelm her. For a brief moment, she thought about doing as the Sith were taught, taking these emotions and using them to fuel her power, but she couldn’t. Instead, she took a seat in the middle of the room, closing her eyes and drawing on the Force, banishing the thoughts and emotions and calming herself. She needed to be calm to think, to plan, to lead. Unlike many of the other Sith, she preferred a more level-headed approach, rather than choosing to draw purely on passion, anger, and other emotions. Once she’d calmed her mind she focused on the Force signatures of the Jedi, trying to gauge their strength. From what she could tell, they were all fairly strong. Some more than others. Once she was done with this her mind drifted to Dren and she instinctively read him, just as she’d always done. She wondered if he knew she was here or not, what he thought and felt right then, and what he might think and feel once he realized she was there. She didn’t linger long, not wanting to give away her presence if he didn’t already know she was there. After all, unlike everyone else, he’d always seemed to have a knack for knowing when she was reading him. After another minute, she opened her eyes and stood, striding across the room and then leaping down to the ground below. She strode over to where the others waited and filled them in on what she knew. She left out the part where she knew one of the Jedi. That was information they didn't need at present, so she opted to keep it to herself, lest they ask questions that she was neither prepared, nor anxious to answer. Dren watched the last of the rubble fall as the tunnels filled with dust. It was blocked, and it was evident that they were no longer using this tunnel to get out. He hoped they were correct, that there were more entrances. They were now in a split tunnel, leading in two different directions. Lightsabers still lit the tunnels, but only so far. They could make out more of the ancient glowing carvings, which bathed the otherwise pitch black tunnels in dim ambient light. “What happened?” Jedi Knight Teli asked. “Was the tunnel not structurally sound? Perhaps a small tremor occurred and it collapsed.” Renth suggested. “Or maybe something else,” Dren chimed in. “What do you think?” Lotheal asked Dren with an inquisitive tone. Everyone fell silent for a moment, contemplating the situation. “There may be more unstable tunnels, so be cautious as always,” Lotheal told them. Suddenly, Dren’s mind went hazy for a moment. He couldn’t think straight, like if the blood was draining from his head. He felt something familiar. A bit like the cold drip on the back of his neck, but this was also warm at the same time, enveloping his body in it. He didn’t know what it was, but he felt like he should. “Are you alright?” Asha said as she placed her hand on Dren’s should. She made sure to keep away from the other Jedi who were planning what the next move was. “Yes it is. But we’re all here to help you.” Asha gave him her signature smile. It was never forced, only soft and kind. Just then one of the Jedi, Shiek Foren, A Zabrak with face tattoos, began to walk away down one of the tunnels. He had been quiet this whole time, as he always was. He had a disfiguring scar on the left side of his face, which looked to be caused by a lightsaber, and left a white eye. He could have chosen to have a cybernetic eye with several enhancements. However he refused. He still had a good eye, and he knew the force gave him far superior enhancements to what a cybernetic eye could give. He was stubborn like that. “I’ll take the girl, but the kid’ll slow me down,” Sheik cut in. Dren couldn’t help but feel hurt by the comment. As if he didn’t already feel out of place, one of the other Jedi confirmed he didn’t belong. “I’ll do fine,” Dren told him, with a grit of his teeth. So they split up, and Dren now trailed behind Sheik and Asha. He wasn’t sure what to make of Sheik, but it certainly wasn’t a great first impression. At least Asha was there, as if to balance things out. They walked down the tunnel for what felt like a good half hour, when they saw natural light for the first time. The tunnel opened onto what looked to be a massive five story room, with statues lining the walls, and bridges at various levels intervening with each other. It looked almost like a throne room, or a place of worship, but neither of them explicitly. The carvings also made it onto these walls, glowing ever so slightly. Most of the room was bathed in natural red light from the sun, which poured in through small sky windows at the top. “This is impressive,” Dren blurted out, feeling the awe of the place. Aeris explained what she knew to the others, including the location the Jedi had been and whatever she could find about them in the short time she'd spent examining them. It wasn't a detailed dossier or anything, but it was something to go on, which was more than they'd had before. Once she'd given them the rundown, she decided that they should split up. The Jedi were no longer masking their presences as they had been before, so she decided that they, too, should split up. There was no point to sitting around waiting and she knew that the others would all get antsy and impatient if she chose to wait for the Jedi to make a move. Besides, she doubted that the Jedi knew that they were here, so that gave them the element of surprise if they confronted them now. With that in mind, she split them into two groups based on their strengths, ability to work together, and the strength of the group they were most likely to encounter. "Jax and Titus, you're with me. We are going to track the first group. Rixar, Cain, and Saila, you will take the second group." she explained. "Don't rush into battle if it isn't necessary, and if it is necessary, be careful to make sure that you know your opponent before you make a move." She warned, knowing that many of them were impatient and quick to jump into a fight. Saila was a little more cautious and careful to know what she was getting into before getting into it, so she expected that she would keep the other two, particularly Cain, in line. She knew that it would almost certainly end in a battle between the two groups, but that didn't mean that they couldn't be at least a little cautious. Whether or not they were fond of the idea, each of the Sith nodded their heads, knowing better than to question her orders. "Good. When you find them, let me know before you engage them." She instructed. "Move out." With that Jax and Titus, a white-skinned Rattataki male with dark tattoos across his face and his bald head, followed Aeris as she strolled away, leaving the other three to followed their own orders and find the second group. Aeris had assigned her own group to find Dren's group, whether intentionally or unintentionally. She led Jax and Titus deeper into the temple, towards the area where she sensed the Jedi. It was a bit of a walk and she kept a moderate pace, covering the ground quickly, but not too quickly. Even at the moderate pace they kept and the head start that the Jedi had gotten, they still neared the temple entrance before the Jedi emerged. Rather than linger near the entrance, however, they climbed the stairs up to the next level and concealed themselves, waiting for the Jedi to emerge. While they waited, the others informed her that they, too, had found the group of Jedi they had been looking for. As expected, several minutes later, three Jedi emerged. A Zabrak with a scar and a white eye, a white-haired human female, and Dren, walked into the room from the tunnels. Aeris felt an ache inside as a storm of different emotions slammed into her all at once. Pain. Anger. Sadness. Guilt. There were too many things all at once. Perhaps it was unwise of her to come here. Perhaps she'd let her emotions and her desires cloud her judgement. Not an unusual thing for a Sith, but unusual for her. Regardless, it was too late to question her decision now, even if doubt lingered in the back her mind about her ability to fight him, or to kill him if necessary. She had to push the thoughts and emotions away for now. She glanced around the room, spotting her two companions, each concealed in different locations, waiting for her signal to strike. Yet she hesitated. It wasn't because they were Jedi and she had once been one herself. Had it been any other Jedi, she would have struck without hesitation. She didn't hate them, but she'd not found her place among them, so she wasn't attached to them, either. She hesitated because of him. Some part of her wanted to fight him, to let him know that she was hurt and angry that he hadn't come with her, that he hadn't tried harder to convince her to stay, or come after her. She didn't know that it would have made any difference if he had tried to fight for her, but at least he would have tried. At least she would have known that he cared enough to do so. For all her abilities, this one thing escaped her. Yet, while some part of her wanted to fight him, another did not, because some part of her still cared for him. Although, she supposed that if she didn't care, then these emotions wouldn't exist. It wouldn't hurt even now. It would have been easy to let him go. Regardless of her feelings, though, she knew that she had to make a decision, and she had to do it now. She couldn't let her emotions get in the way of that, nor could she let them cloud her judgement. She pressed her lips together and furrowed her brows slightly before she came to a decision. She had to confront them. She wouldn't start with violence, as that wasn't her way, but conflict seemed inevitable, no matter what choice she made. The Jedi had moved away from the entrance to explore, putting them in full view of all three of the Sith above. After a moment, Aeris emerged from her hiding place, stepping out from the shadows into the red light that bathed the room. The light cast a long shadow toward the ground below, which was likely to alert the Jedi to her presence. It also cast a shadow across her face, somewhat obscuring her features. She did not, however, have a hood pulled up as her companions did, so her hair, which seemed even redder in the light of the red sun, was unmistakable, at least it would be for the one who knew her. "It's been a while since I've seen a Jedi." She spoke in her usual cool, nonchalant manner, managing to keep the emotions from her voice, if only barely. She didn't bring attention to the fact that she knew Dren, although she wouldn't go to any real lengths to hide it, either. She narrowed her eyes slightly as she observed the three, noting the difference in Dren's appearance now, as opposed to when she'd last seen him. He was older, more mature, but many of the other differences were subtle. Her own appearance wasn't too much different. Her hair was a bit shorter than it had once been and she, too, was older and more mature. Her attire, too, was different. Rather than the traditional brown Jedi robes she'd worn before, she wore black, her outfit consisting of a long long-sleeve top with a few small gold accents, a belt, bracers, gloves, long pants, and knee-length boots. Her attire differed from her companions, just as the color of her lightsabers did. Her green eyes took him in and then glanced at his two companions, her mind reaching out through the Force to anticipate their moves, should they choose to attack rather than talk. Her own companions remained hidden from view for the moment, waiting to see what the Jedi would choose to do, and what her next move would be. "You're a long way from home." She spoke again, taking a few steps closer to the edge that overlooked the floor below. Her face, which was even more beautiful than it had once been, was no longer covered in shadows, instead it was bathed in red, but clearly visible. Unlike her companions, her face showed no signs of dark side corruption, nor was her presence particularly menacing. The dark side was present, but it was not all-consuming. "I must say. Coming here wasn't the wisest decision." She spoke once more, her voice still holding the same calm tone it had before. There was no threat in her words. A warning, perhaps, but not a threat. "What ever shall we do?" She asked to no one in particular. In truth, she didn't know the answer to this. She might not be eager to jump into combat, but she couldn't deny that letting them go would be illogical. They had, thus far, managed to keep their existence a secret. There were rumors here and there, but they had been careful to avoid anything that might confirm these rumors. If these Jedi left alive, their secret would be out. This troubled her somewhat, but she avoided letting this show, instead she simply observed the Jedi from behind a mask of nonchalance, waiting. Dren walked into the room, feeling the awe of it all. Statues that loomed over them like watchful vanguards, watching their every step. The red light was still something to get used to. Most worlds had yellow suns, with white light. The red was both ominous and soothing as well. The color always brought him a strange feeling of solitude. Perhaps it was because of her hair. Or perhaps it was something more, deep within him. “It’s been a while since I’ve seen a Jedi,” called out a voice that was eerily familiar. Dren’s mind was hit with that familiarity, and he was instantly brought back to the crystal caves. He heard her call to him, even scream out in pain, as he was being tested. The voice was etched in his mind. Was he being tested again? Was this a trick of his mind, like the caves? He moved away from the room to join Sheik and Asha. They looked up to a dark figure, whose shape also seemed familiar. Dren looked to his comrades, to make sure he wasn’t hallucinating this, as he might have with the mist.They seem to be fixated on the tall female figure as well. They took out their lightsabers, igniting them in preparation--both blades. Dren followed by doing the same. Was it her? If it was, then how? Of all places to run into her, why here? Was she a sith? Then he felt it. That feeling he felt earlier. Warmth and cold, coursing through him. It felt like he was on fire, but needed to bundle up, as though he had a fever. None of them responded. Dren’s heart began to pulse in anticipation. What was this? Dren stretched out with the force, and could feel the other force users, and the strength of the dark side. Sheik had done the same.“Sith,” Shreik said quietly to the others, with a snarl of his teeth. He positioned himself carefully, to make sure he was ready to fight with his saber. Dren and Asha did the same, forming a delta formation. “You’re a long way from home,” said the voice again, settling in the back of his mind. It sounded just like her. It felt like her, and as she stepped out of the shadows--it was her. A flood of emotions poured into him. He looked into her green eyes with his own, and he was brought back to the last time he saw her.They got into a fight, and he had said things---things he didn’t fully mean to say. Then she left. After all that time, it was as if their friendship--their feelings, meant nothing to her. She seemed to be looking directly at him. Her face seemed stoic to him, while his was unable to contain the shock. It was as if she knew he was coming, but he couldn’t be sure of it. After the moment he needed to process everything, he was instantly drawn to her. Her red hair seemed to glow in this light, while her soft features had changed from the young woman he once knew. She was, for the lack of better words, absolutely beautiful. He remembered why he was so in love, if a he could call it that. He was young, and attributed his feelings to lust, something forbidden by the Jedi. Lust clouded the mind. So he kept it suppressed, and trained many years to do so. He trained to forget her. "I must say. Coming here wasn't the wisest decision," she continued. “What ever shall we do?” Did she even know it was him? She was acknowledging him with her eyes, but not her words. Did she care so little of him? Did she hate him now? Dren wanted to explain who it was, but Sheik was too brash, too impulsive. Dren could only say “wait” after Sheik leapt into the air, up high above the second floor, with his lightsaber lifted, ready to strike down on Aeris with his blade. Aeris watched the three Jedi in silence after her last words were spoken. Her eye were focused on Dren, but her mind watched his companions. She ignored the Zabrak's comment before he instructed the other Jedi to attack before the Sith got the upper hand. He had no idea that they'd lost the upper hand the moment she'd felt Dren's presence hours before. Then again, he likely had no idea that she'd seen them coming, that they had planned this and waited for them, or that another group of Sith was likely battling their comrades right about now. He truly had no idea. Then again, there was no way he would know unless he stopped to think and try to put the pieces together, but that didn't really seem to be his style. The brash actions of the Zabrak following his instructions were easy to anticipate. He was impulsive rather than calm and patient as Jedi were generally expected to be. Strangely enough, when Dren spoke, she was somewhat surprised. She knew he'd recognized her. She could see it written all over his face, if her abilities did allow her to feel all of the things he felt. And yet she didn't fully expect him to react as he did, telling them to wait. Why had he done this? An attempt to protect her, despite everything? Or was it something else? It was somewhat foolish, trying to stop a Jedi from attacking a Sith, perhaps in hopes that she wasn't evil, despite being a Sith. Still, she was thankful that his instinct wasn't to attack her in anger and try to hurt her or worse. That wasn't exactly the Jedi way, but even Jedi were not as immune to emotion as they wanted people to believe. She knew that better than anyone. Still, whatever he was thinking, she ignored him for the moment, focusing on the Jedi who leaped into the air above her. In a split second her hilts were in her hands and her white blades sprung to life. She blocked his blow with both blades, using the Force to soften the blow just a little and to root herself in place so that she wasn't forced back more than a few inches. A second after the impact, the moment she'd fully regained her footing, she pivoted to the left and kicked toward the Jedi, her right foot slamming into his abdomen and sending him flying backwards towards the wall opposite her, not with her own physical strength, but with the Force. A moment later Titus appeared to her left, his red double-bladed saber igniting before he leaped towards the Jedi, engaging him and preventing him from returning to Aeris. The darkening of the otherwise bluish white skin on his face and the flashing of his now red eyes betraying that he was a servant of the dark side, as did the twisted look on his face that told that he would enjoy putting down a Jedi. Jax appeared to her right and leaped towards the female Jedi, his red blade igniting mid air. "I will be your opponent." He informed her as he landed in front of her, blocking her from moving towards Aeris or Dren. His yellow eyes met her blue and his face, now darkened because of from his use of the dark side and enhanced with cybernetic implants, held a look of darkness, despite the otherwise almost stoic look on his face. He twirled his blade once before attacking her. Once the other two Jedi were sufficiently distracted, Aeris dropped down to the ground below, landing lightly and gracefully a few feet from where Dren stood. Her lightsabers were no longer active, but her hilts remained in her hands, just in case. Given that he'd tried to prevent the other Jedi from attacking her, she didn't think he would attack, but she didn't have the luxury of being that trusting, especially considering everything that had happened. "Hello, Dren." she finally acknowledged him, her voice calm as it was before, but it was noticeably softer than before. Her face was calm, but the storm of emotions swirling in her green eyes was unmistakable. Pain, sadness, heartbreak, anger, and maybe even a hint of happiness hidden behind it all. Her companions had attacked the other two Jedi and had now maneuvered them towards the adjacent rooms, away from Aeris and Dren. Before any actions had been made by any of the Sith, Aeris had told the other two that she would handle Dren. Her strength in telepathy wasn't anywhere close to her strength with empathy, she was still capable enough to send simple messages such as this. The other two hadn't questioned her, nor had anything else been said, not that they were in any position to question her or discuss the matter. They'd simply acted on what she had said and divided the other two. Titus had taken the first Jedi because he was the most anxious for a fight, which left Jax with the other. Unlike her companions, Aeris hadn't made a move, to attack or otherwise, nor did she say another word. In truth, she had no idea what she wanted to say or do. She wanted to fight him, to show him that she was hurt and angry, and yet she didn't. She wanted to speak, to ask him how he'd been and tell him how she felt, to tell him that she'd missed him and despite everything, that she'd never forgotten him. She wanted to find out if he felt the same way she did, to hear him say it, and yet she didn't. Her heart and mind were conflicted on what actions to take. The fact that she was a Sith and he was a Jedi, that she should kill him and all of his Jedi friends to keep their secret, or the consequences she'd face if anyone found out that she'd hesitated to attack and kill a Jedi were not factors in her war with herself. The Sith was drowned out by the woman who saw the man before her as a man she'd once known, that she'd once allowed herself to fall for, rather than a Jedi. She had incredibly mixed feelings, but she couldn't seem to act on any of these feelings, good or bad. She just stood there in silence, her green eyes searching his, her mind searching him to determine his reaction, his feelings, beyond what she could see on his face and in his eyes. Sheik flew across the room, and into a pillar. It cracked and dust bellowed. He slammed to the ground, but used the force to cushion his landing--but it still looked like it hurt. Aeris had power to her, strength that Dren hadn’t seen before. She was stronger than he had remembered. She was always stronger than him, faster, better even, but it was still so strange to see her so grown up. She was different. Sheik and Asha both met their opponents, and were pushed into another room. Dren held his lightsaber ready, the hum of it droning with the wails and hits of the other lightsabers caught in battle. Dren took one foot back, ready in a stronger fighting stance, holding his saber out, as he watched Aeris come towards him. She landed to the ground, the fabric of her clothes gently flapping, a bit of dust pushing to the side of her landing. She was so graceful, beautiful even. Dren tried his best to keep his emotions in check. He knew her when he was young, and she could read him like a book. Yet now, older and more trained, he closed off his mind, clearing it of all thought, just as his meditations had taught him to do. He didn’t want her to have the upper hand by reading his feelings. He could still feel that connection between them, something tying them together. Dren couldn’t help draw his attention away to his two companions battling two sith. The dangers they faced, he wanted to help. Yet if he moved the wrong way, she might attack. He didn’t want to believe she would, but clearly he didn’t know her anymore. The Aeris he knew wouldn’t dream of it, yet her companions were trying to kill two Jedi, and she didn’t seem to even care. She had no lightsabers ignited. Still, he kept his open, ready. He didn’t know the person in front of him. He didn’t know what she was capable of. What tricks she could play on him. “Hello Dren,” she told him. Her voice, smooth as ever. It was calm, caring, the words felt warm and embracing. He closed his eyes for a split moment to breath, keeping his force presence always aware, lest she decide to attack right at that moment. He breathed out and opened his eyes. He pushed out all thoughts. Her face, it said many things, yet nothing at all. He couldn’t tell what she was feeling. Still, one emotion boiled to the surface of his calmed mind. Disappointment. “So, this is what you’ve become?” he told her with his own calm voice, unable to say much more. “Ah!” screamed Asha to his right. Dren snapped his head and saw that the cybernetic sith she was battling had managed to slice a wound into the side of her torso. She jumped back, holding onto the smoldering gash. As the sith raised his lightsaber, Dren acted quickly. He turned away from Aeris, not caring if she would attack, and flew towards the battle. He managed to just land his blade in time to block it from cutting Asha down. Dren spun around and kicked the sith in the back, sending him to the ground, giving enough time for Asha to regain her composure. Aeris paid little mind to the other Jedi. She was aware of them, that they had been pushed into adjacent rooms, but she never focused on them. Her companions could handle themselves and she was more interested in the Jedi who stood before her, lightsaber still active, positioned in a fighting stance, as though he expected her to attack. Unlike when they were younger, he had cleared his mind of all thoughts and managed to prevent her from reading him to the full extent that was possible. Still, she could feel the connection that still lingered, even after all this time. This connection made it nearly impossible for him to completely close himself off from her, even if he otherwise had the strength to fully resist her. Regardless, he did quite a good job at hiding his emotions and clearing his thoughts. The only things she could make out for certain were his concern for his companions and his disappointment in her. She had to admit, it stung a bit, despite her best efforts, when she heard those words and felt the disappointment in him. He knew nothing of who she was now, yet he dared to judge her? It stung, but it was also frustrating. Still, she managed to hide the frustration, even if she hid nothing else. Her expression was, no doubt, hard to read. It carried the weight of everything she felt while still, somehow, managing to show nothing at all. It was an acquired talent, really, one that was unique to her, or so she'd been told. She guessed it was due to her natural affinity to emotions. Dren, however, was a different story. He'd always been better than her at remaining calm, keeping his emotions in check. Even now, despite how much stronger her abilities had gotten, despite the bond they shared, she still felt little, and his face showed even less. "Don't presume to know more than you do, Dren. You know nothing." she replied in the same calm voice, but her brows furrowed ever so slightly. She opened her mouth to speak again but was cut off by the scream of one of the Jedi. She pressed her lips together and glanced between him and the room where the scream had come from, seeing the Jedi, who was now wounded, and Jax who stood over her. She made no move to stop Dren as he rushed off to aid his companion. Jax would be fine for the moment. She frowned as she stared off in the direction he'd gone. What was she to do? She couldn't interfere without compromising her position among the Sith. They forgave many of her "quirks" as they liked to call them, but they would not forgive her saving a Jedi. Not to mention that doing so may very well lead to the Jedi learning of their existence. She could have pulled Dren back and sealed the room off, but then the Jedi would surely die and Dren would, undoubtedly, be angry with her. He might even hate her for this. Yet she couldn't simply stand by and allow her companion to face two Jedi alone. He was strong, but between the two, even he couldn't hold out forever. Besides, he was one of her only real friends among the Sith. She had to interfere, she knew that. The question was, how to do so while giving both sides the impression that she she wasn't against them. The thoughts flit through her mind in a matter of seconds, her eyes focused on the battle before her. Jax had managed to block the attacks of the two Jedi, but Dren was readying to strike again. Jax wouldn't be able to stop it. She cursed to herself and pushed off from the ground with her right foot, moving quickly across the room, using the Force to augment her speed. A moment later she slid in between the two, her white blade blocking Dren's blade, her red hair and cloak fluttering behind her and dust stirring around her from the quick movement. Her eyes were closed for a moment before she used the Force to push the two Jedi back. It wasn't a blast like before, meant to throw them across the room, but rather a small blast only strong enough to push them back far enough to prevent an immediate attack. It wouldn't knock them off their feet or hurt them in any way, it would simply put some distance between them. She stood up straight, lightsabers in her hands as she glanced between the Jedi and her companion. What to do? She was silent for but a moment before she spoke. "I see." she frowned. "You let me go so easily and presume to know who I became as a result. Yet for her, you rush to her side and leave me behind?" It was silly, the idea that he was responsible for who she was, or that there was anything other than friendship between him and the other Jedi. But no one needed to know her true feelings. "If your new girlfriend is such a distraction, then perhaps I should remove her from the picture?" her face and voice gave away nothing of what she felt as she stepped forward, reaching out with the force and lifting the girl up by her throat. She watched as the girl's feet left the ground, flailing as they did. She then threw her into the next room and leaped after her, clipping her sabers to her belt and using the Force to pull the two doors that separated the rooms closed behind her. She then used the Force to create a cushion so that the girl didn't hit the wall so hard, and then caught her in her arms before she hit the ground. She hated to leave Dren with Jax, but Jax knew better than to kill him, as she'd specifically given them instructions before, and Dren was in a better position to fight than the girl had been. She knew Jax had been surprised by her actions, but he didn't question them, even in his mind, so that was good. It had worked, then. Good. She just hoped that Dren would eventually realize why she had said and done what she had. "This will be troublesome to explain later." she sighed as she placed the Jedi on the ground, leaning her against the wall and examining her. "Sorry. But it's just easier this way." she spoke with a surprisingly gentle voice as she reached out a hand and used the Force to leach energy from the Jedi. It was enough to steal her consciousness and put her to sleep for a short time. She couldn't risk the Jedi trying to fight her. She examined the wound and frowned slightly. Healing the wound of a Jedi that was created by her Sith companion. She thought that had to be frowned upon. Regardless, the wound was pretty deep. It was likely bleeding inside and slowly sapping away her strength. It shouldn't matter to her. Perhaps it didn't. The girl meant nothing to her. But she wasn't cruel or heartless, nor did she wish for Dren to truly hate her. She disregarded the thoughts and placed her hand over the wound and reached out with the Force, touching the very cells within her. She could feel the Force flowing through her and into the Jedi, into her cells, stopping the bleeding and beginning to pull tissue back together. She stopped before the wound was fully healed, or visibly changed. She didn't want to waste all of her strength, nor did she wish for anyone to know what she'd done. She wasn't a healer, so the task took a great deal more of her strength than it would have for someone with more practice in the art. She couldn't risk any more, even if she weren't trying to keep her involvement a secret from her companions. Aeris’ words, “you know nothing,” lingered ins his mind--echoing. He wanted to believe that he was wrong, which was what she seemed to imply. Yet here were her companions, trying to kill the Jedi. Only Sith would do that. Only Sith deal in absolutes, as once said the ancient Jedi Master Obi-Wan Kenobi. So wasn’t Dren doing that? Believing she was a Sith, absolutely? Still, the red blades and the people she surrounded herself in, was quite damning. He could only hope that she wasn’t. Doubt filled his mind. He swung his blade, left and right, trying to help defend his fallen comrade--when Aeris launched herself between them. Graceful as ever, she pushed her companion and Dren away from each other, ending the fight for a quick moment. It was a small push, and he only slid a few paces away, managing to stay on his feet. He kept his lightsaber ready, unsure of what would transpire next. Was this the start of her attack? Did she want to kill him herself? Why didn’t she attack before? So many questions. Her words, it was almost as if she were jealous with Asha, and the attention he was showing her. He was simply trying to save her life as any friend would. Dren didn’t know what to say, but he was certainly hesitant to say anything--to do anything, until he could understand what was happening. Then, in a moment, Asha was lifted into the air, trying desperately to breath. A Sith choke hold--he knew it--she was a Sith! Before he could react, Asha was thrown into a room, Aeris jumped after her, and the giant stone doors slammed shut with a massive boom. “Asha!” Dren screamed, fearing for his friend. He turned off his saber, and ran as fast as he could to the doors. But he was pulled backwards, into the air--the cybernetic Sith was pulling with his hand outstretched. “You’re not going anywhere, Jedi!” Dren flew at the Sith, and turned. He ignited only one blade of his saber, as he was more comfortable with the style, and held it ready. Their lightsabers clashed, and Dren flipped over the sith, landing perfectly, as he lifted his saber over his head for a block. Their sabers sizzled. He pushed off, turned and swung wide, but missed. The sith used the opening to kick Dren in the stomach. Dren flew back and used the momentum to do a backflip. He charged at the Sith and stabbed the lightsaber forward, but the Sith blocked and pushed the Jedi aside, spinning for a surprise swipe, which Dren just barely managed to duck underneath. Back and forth, the two fought, but Dren tried his best to end it quickly, to get to Asha as fast as possible. He knew that Sheik could handle himself, and was comforted by the sounds of lightsabers still clashing in the distance. Still, he couldn’t imagine the horrors that Asha was experiencing at the hands of Aeris. Dren screamed and swung his blade hard, again and again against the sith in the same place. Their sabers locked, Dren swung his blade, spinning the Sith’s blade, and making it fly across the room. Dren swung at the defenseless Sith, but he dodged, over and over again. Dren swung like a madman, but the Sith moving out of the way as if only a minor inconvenience. The Sith then ran along the wall, jumped into the air and reached for his saber with the force. Dren ignited his second blade, and timed the flight of the Siths jump. He screamed and threw his lightsaber. It spun with the two blades, like a deadly disc, into the air. The Sith’s eyes grew wide open. He no longer reached for his saber, but instead pushed down with the force, making him go just a bit higher--the blades just cutting off a piece of his clothing, but flew past him--and into the same pillar with the crack in it from before. A clean slice went through the pillar, and from it a chunk cracked and fell. The pillar was still intact, but there was a low rumble from above. As the sith landed he reached for his lightsaber, and looked up. The pillar began cracking slightly, but stopped. Dust fell from the ceiling. Dren wasted no time while the Sith was distracted, and ran to the doors. He leapt into the air, and slammed his fists onto the ground as hard as he could, sending a shockwave out from him. The floor cracked below him, and the shockwave blew the doors open and everything in it’s path went flying. He saw Aeris over Asha, who was unconscious or dead, and Aeris was doing something to her. Aeris frowned when she felt Dren coming closer to the room. Was he that determined to save this girl? Did she matter that much to him? She supposed it wasn't surprising that he wanted to protect his friend. She couldn't fault him for that. And despite her display before, she knew it was nothing more than that. She wasn't actually jealous of the other woman, except perhaps the fact that he seemed to care for her a great deal, while she seemed to mean little. He was disappointed in her and assumed the worst of her. Even now he undoubtedly feared what she was doing to the other Jedi. As she healed the girl, her comm went off. "How are you holding up?" she asked as she answered the call, pushing her thoughts from her mind. "We're holding our own. But some back up would be nice, if you can spare someone." Saila replied. "Got it." Aeris ended the call just as Dren smashed his fist into the ground outside the door. She reached out to Jax using the Force. "Jax." she spoke within his mind. "Go give Saila some backup." she instructed. He couldn't actually respond, but she could read him through the Force well enough to know that he agreed to do as she asked, and she could feel him heading off in the direction of the others. Good. That meant no distractions. The moment the doors flew open she stood, spinning on her heels to face Dren, who now leaped towards her. Rather than using her lightsaber, Aeris reached out a hand and used the Force to send a blast at him, strong enough to throw him back against the wall behind him. From there she leaped after him, activating a single white blade, using the Force to press him back against the wall. She landed inches away from him, her blade meeting his and pressing against it. "My, aren't we presumptuous." she narrowed her eyes as she spoke in a sort of casual manner unbefitting the situation. She stared into his eyes, hesitating to make a move. After a moment she sighed, "Your friend is fine." she informed him, knowing he was worried that the girl might be dead. It would make if difficult for them to have any sort of conversation if he was focused on the other woman and her well-being. "She's just unconscious." she added, not mentioning that she had healed the girl. He didn't need to know that. She hadn't done it for praise or his approval anyways. She kept him cornered for a moment longer, her saber pressing against his with enough force to make movement difficult. "I'm not who you think I am, Dren. I might be a Sith, but I'm not like them. This was never what I wanted." Her words this time held a little warmth, and her sincerity was obvious. She hesitated a moment, her green eyes staring into his for a moment longer, showing her frustration at the situation, and a myriad of other emotions that bubbled just below the surface. After a moment she clicked her tongue and looked away, jumping backwards and landing in the middle of the room, stepping to the side to allow him to go to the other woman, should he so choose. Her saber was no longer active as she watched him, waiting for his next move. She had no desire to fight him, but she wasn't sure that the feeling was mutual. She wondered what he would do. Would he believe her? Would he check on his friend? Or would he continue to presume to know the situation and attack her once more? She wanted to explain things to him, just like she wanted to tell him how she felt about everything, about her leaving, him staying, about how he didn't try to stop her or fight for her, and about how much it hurt that he thought so little of her now, even if she didn't show that pain. She wanted to explain why she was standing before him as a Sith when she had left to become a grey Jedi. She wanted to tell him that she wasn't a servant of the Dark side, even if she did wield its power, since he was clearly too distracted to put those pieces together for himself. She wanted to tell him so many things. She also wanted to ask him so many things. Why hadn't he tried harder to get her to stay? Why hadn't he come after her? Fought for her? But those things could wait. They would have to. This wasn't exactly the best time and place to be having a heart to heart, no matter how much she might want it. At any rate, she didn't even honestly know if he was the least bit interested. She didn't know if he still held any fondness for her, or if he was just hurt, angry, bitter, or perhaps even indifferent, although she doubted the latter was the case. All she knew for sure was that he was clearly disappointed in her and obviously thought the worst of her. She guessed she couldn't blame him, really. He was just going off of what he saw, rather than allowing his memories and his past feelings to get in the way. Perhaps there was more to it than that. She didn't really know at this point. Still, she wished he would at least try to understand, to figure out why she was a Sith, what had happened, who she actually was, despite whatever title she held. Or at least give her a chance to try to explain before he passed judgement on her. Either way, she guessed that she wouldn't really know how he felt about any of it until he told her, since he seemed intent on trying to prevent her from reading him. Rather than asking, however, her eyes met his, searching them for any sort of answer and waiting to see what move he would make. Dren felt the force push blast through him. He tried to keep grounded, but Aeris was always stronger than him with the force, and it sent him flying. He landed upright, to his surprise, but mostly because a wall stopped him. The hit took the air out of his lungs, and he had to gasp to bring it back in. His eyes grew wide as he lifted his lightsaber. She leapt at him, with her white blade. Their sabers clashed. There she stayed, keeping him pinned with her Lightsaber, and the wall behind. He stared at her, the light sabers sizzling. Flashes of green and white fell onto her soft features. Seeing her this close, it stirred something familiar in Dren. She spoke, but he didn’t respond. He kept his gaze, always diligent, trying to not let her get the upper hand and kill him. Still, he tried to watch Asha, seeing if she was okay, but making sure to not let his gaze leave for more than a moment. Then Aeris said something that caught him a bit off guard. “—but I’m not like them—“ she said. Those words stayed with him, making him wonder. She was always a bit different from the Jedi, but if there was one thing he learned, it was that the dark side is not something to be tampered with. The dark side corrupts, and it feeds anger and hate. So how was she not like them? How could she skirt with the dark side, yet not fall into it? All of the stories he had heard of good Jedi turning dark, were never part way. Darth Vader was once a Jedi, one of the greatest, and he succumbed to the dark side. The story goes there was good in him that came out in the end, but the story changed from storyteller to storyteller. No matter the version, Darth Vader was certainly no Grey Jedi. He stared at her, his heart unable to tell deception from truth. He still heard fighting in the background--lightsabers clashing, grunts, and bodies slamming against walls. He tried to ignore it as he had other matters. He looked into Aeris’ eyes. No yellow, no red, only green. Like his saber. He always thought the color of his saber reminded him of her eyes. Over years he just thought it was a false memory, perhaps a fabrication. Yet they were the same shade. It was as if they were connected. He wanted to say he believed her, but then he would be lying. He wanted it with all of his heart, but he knew she could be trying to trick him. That is the way of the dark side, deception and hate. He gritted his teeth, and decided to gain the upper hand again. He grunted and used all of his strength to push out with the force. A shockwave, like before, emanated from him. The blast sent Aeris flying away. Dren held his saber ready and came for her--but stopped. He looked at her, wanting answers. The battered pillar behind them began to crack, and the upper ceiling began to rumble. Dren looked at it, waiting to see if it would fall, but nothing came. The rumbling stopped. Clearly, the temple was no longer safe. For how long, Dren didn’t know. He wanted answers though, so he waited, hoping his Jedi comrades could hold on just a bit longer. Aeris watched as everything played across his features. He didn't believe her. She didn't need to read him to see that. It was written all over his face, not to mention that it was exactly the reaction she expected, if not what she hoped for. Why would he believe her? She was here with the Sith. All evidence pointed to her being one of them. Sith weren't exactly known for being beacons of truth. They were manipulative and deceptive. If he believed her to be one of them, then he would naturally expect the same of her, even as she was trying to tell him that she wasn't like them. As far as he knew, she was lying, trying to get him to let his guard down. She didn't move for a time, just stared at him, partly because he could decide to attack her at any moment, and partly because she couldn't quite seem to tear her eyes away from him. Evidently he decided to take this opportunity to gain the upper hand. He sent out a shock wave through the Force, sending her flying backwards. She managed to twist herself midair so that she landed on her feet, continuing to slide back another couple of feet before she finally stopped. She frowned when he held his saber ready and came after her. Despite him coming after her, she didn't reignite her saber, which she'd deactivated after being sent flying backwards. Instead she stood there, an unusually serious look on her face. What was she going to do? She didn't want to fight him. All she wanted was to make him see. But how? Thankfully, for whatever reason, he stopped before he reached her. She hesitated to answer his question. Not because she feared his reaction, but because it wasn't something that was easy to explain. "I..." she began, but hesitated once more as the latter question sunk in. What had happened to her? Did she really seem so different to him? She glanced up at the pillar that cracked, then to the ceiling that rumbled for a moment before stopping. This place wasn't going to be safe for much longer. He had to know that. Yet he stood his ground. Did he want answers that badly? She wanted to give him those answers. She just hoped he would believe her rather than disregarding what she had to say because of the way things appeared. "That isn't an easy question to answer." she finally spoke again, her green eyes once again resting on him. She put her lightsaber away, as a sign of good faith. A foolish move, perhaps, but she just had to hope that he wouldn't attack, and if he did, that she could either stop him without her saber, or draw her saber fast enough. "I don't walk among the Sith because I want to be like them. I do it because once, they were like me. Or at least I thought they were." she tried to explain. "I do it because the other option is to give up on them and let them fall completely into the darkness with no one to remind them that it's wrong. I do it so that maybe, just maybe, I can prevent them from becoming like the Sith of old. I do it because... I have nothing else." she didn't know that any of that made sense. Maybe it didn't. But it was the best she could do right now. "As for what happened to me... I don't really know how to answer that. Nothing happened to me. Not really. I'm the same as I ever was. It's just that everything and everyone around me changed. For me it was adapt or run away. Again. Last time I chose to run and... " She hesitated, looking away from him. "I didn't want to run again. So I guess that changed. Not that I had anywhere to go even if I did run." she paused and looked back to him, falling silent. She was silent for a long moment, giving him time to speak, if he so chose, before speaking up again. "I'm sorry, Dren." Her voice was so soft that it was barely audible over the distant sounds of battle coming from a little deeper in the temple. She clenched her hands into fists and stared at the ground as she fought back the many emotions she felt. "Why?" she asked, her eyes finally looking up to meet his once more. "Why did you let me? Why didn't you even try to stop me? Was it so easy to let me go? To forget me?" she asked, confusion and pain evident on her features. "Then again, I guess you always did excel at controlling your emotions. Not like me. I never was very good at hiding how I felt, was I?" The tiniest hint of a smile tugged at the corner of her lips at these words. A few moments later, the ceiling began to rumble again, the crack in the pillar beginning to spread. Chunks of debris fell around them, most of it not coming too close to the two of them. "You should go." she spoke up, her words seeming torn and pained. "Take your friend and go, before this place comes down on our heads." she knew it wasn't going to hold up much longer. She didn't want him to go. Despite everything, the thought of letting him go again hurt. She had so many things she wanted to say, to ask. And letting him go now reminded her of the pain she'd felt that day. But this time it was unavoidable. The ceiling wasn't going to hold up much longer, and it wasn't like she could take him back to the temple with her. Besides, he had his friend to tend to. She frowned slightly as the crack in the pillar began to spread to the ceiling above and chunks of debris continued to fall. She looked past him to the other Jedi, who remained unconscious against the wall. A chunk of debris fell, heading straight for her. She could have let it crush her. It wouldn't have been her fault. He couldn't have really blamed her for it. Then she'd be out of the way. But that wasn't who she was. She was a Sith, sure, and the girl was a Jedi, technically her enemy, but she wasn't cruel. She only hoped this wouldn't come back to bite her later on. She reached out with the Force and stopped the falling debris before it could reach the Jedi, moving it to the side and dropping it. "Get her out of here." she tried to force the emotion from her voice and remind him that they needed to go. She'd saved her twice now. Because of him. She didn't know that she would do it a third time. She probably would, if she were being honest, but she shouldn't. There was no telling when one of the other Sith would show up, the way this place was shaking. He sat with her words for a moment. He wasn’t sure what to make of them. She wasn’t a Sith yet she stayed with them, hoping to bring them back. If anything, it shows how dangerous the dark side really was. Perhaps she was an anomaly, or her strength let her stay away from falling to the sith. Or--and this this thought was more painful--perhaps she was just trying to deceive him. To what end, he wasn’t sure. He said something that his training had forced him to say, and he said it without much thought. “Dark, Grey--anyone who skirts with the darkside is an enemy of the Jedi.” He paused, wishing he hadn’t said it. Still, he was a Jedi through and through. Her final words, however, were what struck him the most. She wanted him to fight for her to stay? She was the one that wanted him to leave, to escape from the Jedi, everything he had ever known. He was hurt that she would even ask, that she would even consider using the dark side. Debris began falling, but he had to say what he needed to say as emotions, something he wasn’t used to, welled up inside of him. “I don’t know anything but the Jedi. The light side. You threatened everything I knew. I wanted to fight for you to stay--but you were gone.” A chunk of debris fell nearby, and he looked towards Asha as it was about to hit. He reached out with the force, but Aeris was already out with her hand, and pushed the piece away. Perhaps--she was good. He didn’t hesitate any longer, and knew this temple was done for. Even Sheik and the other Sith had stopped fighting, looking around. Sheik looked at Dren and began running towards him. Sheik looked up and then to Dren. “Look out!” he screamed. The next few moments were hard for Dren to remember as everything was just dust, and he couldn’t make sense of up and down. As far as he could tell, he was hit by another, smaller debris in his gut, which made him and Aeris hit the ground. Unfortunately, thanks to the massive piece of ceiling, the ground had buckled and broken just like the ceiling, and they ended up falling with the ground--down and deep below the temple. Level after level broke and crushed with the weight of the ceiling piece they seemed tethered to. He could feel the ground, the real one, rushing up to them. So in a last minute instinct, he grabbed onto Aeris, and pushed out with the force to cushion their fall. It still hurt though as the wind was knocked out of his lungs. He felt a piece of rock hit him, and he pushed up with the force, making a bubble around them to stop any other rocks from hitting them. It was dark. Above them, for what seemed to be too many stories high, was a touch of sunlight from the top temple. He could still hear the rumbling, and pieces of rock still rained down on them. Yet, as his eyes adjusted, he could see the light glow of the veins of red from the tunnels he knew. The dark side was strong in this place, even deep in the bowels of the temple it was there. He kept his hands out, pushing forward, and turned to Aeris. He could hardly see her, and didn’t know if she was okay. He feared the worst. “Are you hurt?” he asked, hoping for a response back. Aeris could see and feel the doubt he felt. He didn't know what to make of what she said. She couldn't blame him, really. What reason did he have to believe her? There were little clues, here and there, if he chose to see them, but some of them could be attributed to something else. He undoubtedly considered the possibility that she was trying to deceive him. What he thought she had to gain by deceiving him, she wasn't quite sure, but she found it unlikely that the thought hadn't crossed his mind. He was a Jedi, after all, and Jedi trusted no Force users other than those within their own ranks. For Jedi, everything in this world was black and white. There were no shades of grey. Everything was light or dark, good or evil. There wasn't room for doubt, questions, or anything but blind faith in their teachings. That never sat well with her. But she supposed that it was different for everyone. Obviously there were many who were happy to blindly put their faith in the teachings of the Jedi, to follow their rules to the T without so much as a question. She supposed that for some, they found comfort and peace in the idea that they needn't second guess themselves, because their cause was right. After all, if you serve the light, the good in the universe, how could you ever be wrong? As she thought these things, Dren's voice cut through the brief silence, epitomizing everything she'd just been thinking about. She thought she saw something in his eyes--regret, perhaps? This made her wonder. Was that how he really felt? Did he truly see her as an enemy? She supposed he must. After all, he was right, the Jedi demanded that he see her that way. To falter in that, to allow himself to see her as anything else, to believe even for a moment that she might not be evil, that was to doubt the teachings of the Jedi, to doubt everything he'd devoted his life to. Everything he'd ever known. "Don't you think I know that?" She shot back to the former portion of his statement, pausing and taking the time to prevent the debris from crushing the female Jedi. "I never expected it to be easy for you. It wasn't easy for me. I guess I just hoped that..." she stopped, shaking her head and smiling, a sad, somewhat self-deprecating smile. "I suppose that was foolish of me, wasn't it? But then, I was a young, foolish girl who trusted too much in my feelings, and too much in those I thought you shared." No sooner than the words had left her lips, she heard the Jedi scream 'look out,' to Dren, she presumed, causing her to look up to see the debris descending on her. She didn't have time to react. She'd let herself become distracted, and now it was too late. She was just about to use the Force to try to stop the descent--an action she knew would likely be unsuccessful, albeit perhaps not wholly--when she felt a pair of arms around her. Her eyes widened in surprise as she was suddenly moved by the same pair of arms as Dren jumped, trying to get them out of the way. Why? She didn't really have time to wonder, as the world around her suddenly changed. The room filled with dust, making it impossible to see anything as they crashed into the floor, which soon buckled beneath the weight of the massive chunk of ceiling that had narrowly missed them. They were sent spiraling downward, crashing through floor after floor as the massive object crushed everything in its path. It was impossible, even with Force Sight. There was too much happening, she couldn't concentrate, and the world around her changed too quickly and too often. She was hit by a few loose pieces of debris as they fell, including one to the head. Nothing was fatal, but the sharp pain caused by the impact, mixed with the dizzying course they were set in was nauseating and she found herself fading in and out of consciousness as they careened towards the bottom. She was too disoriented to do anything. Even as she thought they were about to hit the ground, she was powerless to do anything about it. She could try, but given that she had no idea what was up or down, left or right, it was unlikely to do much good, even if she could make herself focus enough to do it. Luckily enough, Dren was able to cushion their landing. The breath was still knocked out of her, but it was a much soften landing than what they otherwise would have experienced. He even made a bubble around them to prevent the pieces of debris that continued to fall from hitting them. She didn't make any move, to sit up or otherwise, instead she just laid there for a moment. The world still felt like it was spinning, so she took a moment to breathe and try to calm herself, mind and body, until the dizziness past. It was then that she opened her eyes and tried to reorient herself. She could see the faint red glow from the veins on the walls of the tunnel, but little else was visible. She groaned a little as she tried to sit up when she heard Dren's voice. "I've been in worse shape." she managed a reply, although her voice sounded pained. She managed to sit herself up, wincing as she did, feeling a sharp pain in her left arm. She could see the shape of something sharp sticking out of her arm. Great. She braced herself and then pulled it from arm, barely managing not to cry out in pain. She held her right hand over the wound and used the Force to heal it, at least a little. She couldn't do much in her present state, especially since the pain made it difficult to concentrate. She managed to stop the bleeding, but not much else could be done for now. She looked up at him, her eyes adjusting somewhat to the light. She could make out his shape, but the faint glow wasn't enough to allow her to see his features clearly. "What about you?" she asked as she glanced over him. She didn't see any obvious major injuries, but it was hard to tell how many minor ones he'd sustained in this light. "We should probably move soon. It's not safe to stay here." she spoke up once he'd answered, pushing her other questions from her mind, at least for the moment.